Unit is 68” wide x 88½” deep x 80” tall. 77″ discharge height, 6” projection. 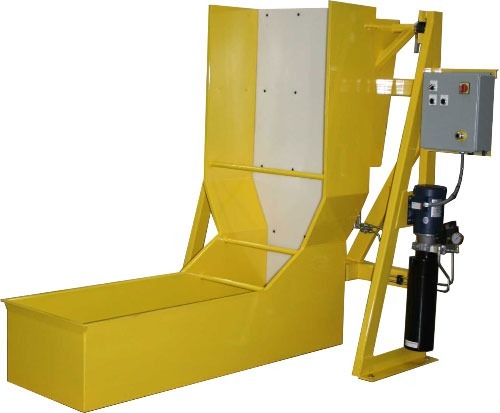 Custom loading skip features a perforated metal bottom. Dump side of pivot carriage features a UHMW liner. Unit is custom designed to allow customer’s existing equipment to traverse and straddle pivot carriage. Hoffman NEMA 12 enclosure with electrical disconnect. Unit features momentary contact controls for pivot and reverse pivot.